Live in a peaceful environment, with refreshing air and greeneries shady trees where you and your loved ones can nurture a loving family life, filled with blissful experiences. Bria Malolos is a new residential subdivision in city of Malolos Bulacan project of Vista Land, one of the country’s trusted developers. With 1,330 units with a total land area of 10.2 hectares offers house and lot consists of four high-class model houses namely Angelique Townhouse, Angeli Townhouse, Angeli Single Firewall and the newest Bettina Model. These house designs are high quality, well-constructed homes that are meant to last a lifetime. It is equipped with everything you need for a world absolute enjoyment, including a multi-purpose hall, guard house, mini gardens, playground, basketball court , jogging path. Bria Malolos is an ideal choice for those who want to have their dream house and to invest for their future families. 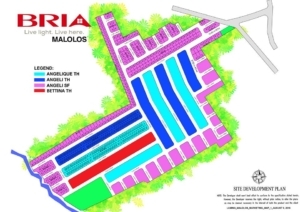 Bria Malolos is the most awaited development of Bria Homes in the province of Bulacan. This developments aims to exceed the success of the previous developments of Bria Homes. Malolos, officially the City of Malolos, is a first class urban component city in the Philippines. Malolos is considered as the 115th city in the country. It is the capital city of the province of Bulacan as the seat of the provincial government. • Via McArthur/NLEX Route. Take Tabang Exit then take entrance at Camella Provence then turn left after last phase of Camella and turn left again on the narrow road near the guardhouse. • Via Lugam Route. Take entrance at Kanto ng Lugam and turn left going to Look 1st and another left again on the narrow road near the guradhouse.